Five Grade Nine Girls from Canada are Sending Watercress (yep, the vegetable) to Space! The Student Spaceflight Experiments Program (SSEP) is a proposal contest about microgravity that can be entered by groups of students in grades 6-9. This year, five grade nine girls from Edmonton claimed the prize for their research on the fast-growing plant watercress and its potential to feed astronauts. The prize: the winning proposal becomes a full-blown experiment in space. This means watercress is going to space! If you want to learn more about the winning proposal or the SSEP, check out this article about STEM research. This site is easy to access and teaches people how to code in the comfort of their own home. You can take coding tutorials, check out a list of mentors, and (if you get really into it) can click around on links to other coding projects and events that will help further your skills! Girls who code started in the U.S. but their free programming is now available in Canada! This non-profit provides girls with the skills, the support, and the network necessary to advance in coding, and you can even start a club in your hometown by applying on their site. The clubs are for girls 13-18 and involve activities from coding tutorials to designing solutions for real world problems. Actua is a national charity that is preparing youth to be innovators and leaders by engaging them in exciting and accessible STEM experiences that build critical skills and confidence. 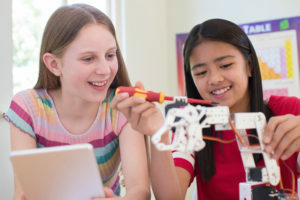 Actua’s National Girl’s Program teaches girls about STEM through various all-girl programs that range from science clubs to camps to conferences. Female mentors assist with these programs, sharing their knowledge and expertise while also breaking down the stereotypes about women that still exist in the STEM fields. If you’re interested, check out their site and search by province to figure out what programs are nearest you! First Robotics Canada is making a push to include more women in STEM and provide them with the support they need. They have a Girls in STEM Executive Advisory Council (made up of a lot of fantastic and successful women) who help break down barriers and encourage girls’ involvement in STEM. First Robotics Canada also puts on events where kids and teenagers work in teams to build lego- based robots (yes you read that right!) designed to perform specific tasks. You can check out their site to see which provinces host these lego robot contests and when! work and reporting! Keep up the very good works guys.